The following articles were written by our faculty and explain key topics in the field of instructional design and delivery. We live in a media-rich culture and a time of great change in education. For many adult learners, multimedia is still a novelty, something to be “figured out” for others, and for most of today’s young students, multimedia is taken for granted, something they have never been without. As curriculum designers and educators, how do we best utilize multimedia in ways that work for all types of learners? 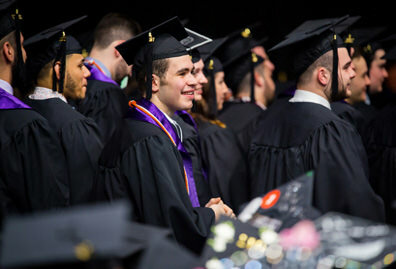 Certainly, the millennial student has very different needs and expectations than the adult learner returning to school for a master’s degree in instructional design to launch a second career. In order to meet the needs of all learners, we must first understand what multimedia is and how it affects cognition, and then we can explore ways to utilize it effectively in our classrooms, board rooms and offices. Multimedia is the use of more than one mode of delivery to present content (Mayer, 2002). When we use words and pictures together, we are using multimedia. Examples include the use of video (spoken words and pictures combined), text and charts, narration and images, music and pictures. In all cases we are using two different modes of delivery to present content. The figure below demonstrates how information is processed depending on the form it takes. Note that spoken words are processed through auditory, while printed words are processed visually. This is an important distinction, as we shall see shortly. Figure 1. Processing of Information Using the Visual and Verbal Channels. 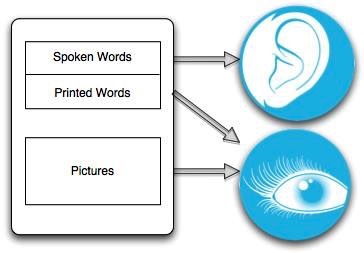 This figure illustrates how words can be assimilated through the ears or the eyes depending on if the words are spoken or printed. Pictures are assimilated through the eyes only. Adapted from O’Connor (2010). The advantage of using multimedia is that when we do so we utilize two distinct cognitive processing channels, the auditory channel and the visual channel to acquire content. A good way to think of this is with a computer-to-brain analogy. In a typical computer, there is memory (analogous to our brain) that processes text (via the keyboard) and images (via the monitor). The same computer memory is processing both streams of information. Memory is finite; the more we use one stream the less is available for the other. However, if we add a separate memory chip for video, we can utilize all of the primary memory for text. Thus we improve processing power (cognition) of the computer. This simple analogy explains how multimedia affects cognition. The brain has separate pathways for the processing of verbal and visual input. By utilizing both pathways, we are improving the efficiency of the brain, thus increasing cognition (Mayer and Moreno, 1998). We know from extensive research that there are optimal ways in which to accomplish this, and ways that we can capitalize on the innate ability of the brain to process distinct information streams. We also know that certain methods are less effective. As instructional designers, this information is essential as we build learning environments for our students. What does this mean for the instructional and curriculum designer? In order to develop effective courses using multimedia, we need to understand the work of Richard Mayer. Mayer has spent decades researching the effects of various multimedia implementation strategies, and while his research is extensive, we can focus on a few key points as it pertains to instructional and curriculum design of courses using multimedia. When presenting new content, knowledge acquisition can be improved by using both channels of the brain to receive and process information. For example, showing images with spoken text is more effective than images with written text, as in the latter case both are processed visually, while in the former, we would use the visual and verbal channels to process the information. Specifically, Mayer, Moreno, Boire and Vagge (1999) studies how temporal contiguity affects content retention, knowledge transfer and matching ability with students. 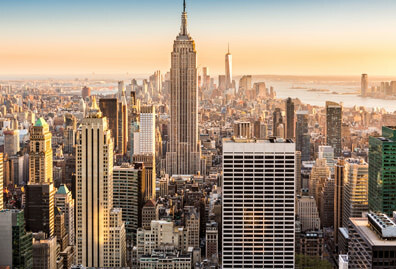 What they found was that when presenting large amounts of content (such as in an online learning environment), it is more effective to present verbal and visual content synchronously. Specifically, by splitting the content into two channels and presenting it at the same time, the brain is more effective in processing the information it is receiving. This has profound implications for our use of multimedia in online learning environments. The idea that words can be processed as either verbal or auditory content is supported by the research into the split attention principle. Mayer and Moreno (1998) examined how students processed information in a learning simulation. They found that when presented with animation using the visual channel and written text, also using the visual channel; students didn’t do as well as those who were instructed with visual (animation) and verbal (narration) content. This supports the notion that text should be used sparingly with images, and narration with images is more effective than text with images. The final multimedia design principle is the Coherence Principle. This principle states that when presenting multimedia content, extraneous sounds and background music have a negative impact on the overall learning effect. Each channel is limited in the information it can process, and the potential for overload exists in both the verbal and visual channels (Sorden, 2005). When presenting essential information such as narration in the verbal channel, it is better to reduce or eliminate extraneous sounds and sound effects (Moreno & Mayer, 2000). This figure depicts how content is processed by different sense organs and different memory channels depending on the mode of delivery. As instructional and curriculum designers, it is important that we understand how the brain processes information. Attention to the design principles listed above can have a profound impact on instructional effectiveness. By managing the multimedia we offer to students, and ensuring that we utilize two synchronous channels for our content whenever possible, we can be more productive as teachers and offer our students learning experiences that are exciting, motivating and effective. Mayer, R. E. (2002). Cognitive theory and the design of multimedia instruction: An example of the two-way street between cognition. New Directions for Teaching and Learning, 89, 55-71. Mayer, R. E., Moreno, R., Boire, M., & Vagge, S. (1999). Maximizing constructivist learning from multimedia communications by minimizing cognitive load. Journal of Educational Psychology, 91(4), 638-643. O’Connor, S. (2010). Graphics to support learning. Retrieved from openedweb website: http://openedweb.com/blog/?s=multimedia. Sorden, S. D. (2005). A cognitive approach to instructional design for multimedia learning. Informing Science Journal, 8, 264-279. Have you ever felt like a winner after buying something through an eBay auction1 or used a Fitbit to compete with friends to see how many steps you can walk in a day? If so, you’ve taken part in gamification, which uses game-style elements in non-gaming situations. Gamification is also being used successfully in education. Instructional technologists aim to reach learners through innovative techniques. Gamification provides that opportunity, allowing students to engage with content in a robust and fun way while maximizing available technology. Progression: Learners of all ages become more invested in a task when they are able to earn points, move up in levels and incrementally continue to improve. Problem-solving: Brainstorming for solutions to a challenge can be like conducting an investigation, exploring all sides of an issue and developing possible fixes. Students can also develop critical non-cognitive skills such as patience and discipline. With gamification, instructional technologists can use their instructional design and technology skills to take traditional curriculums, infuse them with technology and create a game out of the entire process, taking it as far as your imagination allows. 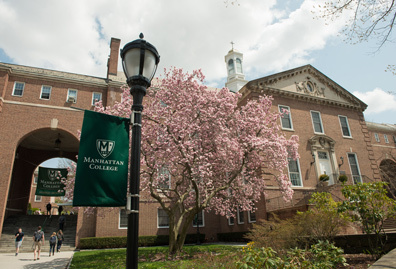 Manhattan College’s Master’s in Instructional Design and Delivery offers a course focused on gamification to encourage interactive learning and engagement with instructional material. The role of instructional technologists continues to evolve. One important skillset that is often required is project management. In fact, knowledge of project management has shifted from being complementary to an essential part of the instructional design process. Instructional designers do not always have the luxury of working with a dedicated project manager. This means they often have to incorporate those duties into their own role. Being able to take on both roles at once can enhance their career outlook. When used properly in tandem, project management and instructional design ultimately produces better outcomes. More and more instructional technology master's programs are incorporating project management into their curriculum. 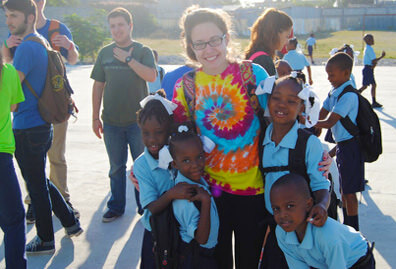 It allows their students to become better, more well-rounded candidates for employment. It also helps them master instructional technology. That is why enrolling in a program that does not provide training on this essential competence could put a student at a disadvantage. 1Van Rooij, S.W. (2011). Instructional design and project management: complementary or divergent? Educational Technology Research and Development, 59(1), 139-158. 2Pan, C. (2012). A symbiosis between instructional systems design and project management. Canadian Journal of Learning and Technology, 38(1), 1-15. 3Van Rooij, S.W. (2010). Project management in instructional design: ADDIE is not enough. British Journal of Educational Technology, 41(5), 852-864. Brainstorming is used continuously by instructional design technologists. The tips that are developed in this article can be applied to various situations and a variety of problems. Brainstorming is a creative, critical thinking process that will be part of training and experiences included in an instructional design masters program. This practice can apply to PreK-12 and higher education curriculum instructional design as well as corporate problem solving and instructional design. Find a group of people to be your brainstorming team- sometimes these are people in your field, sometimes it is good to gather ideas from people outside your field. Once you have your group, establish ground rules that include postponing criticism, encouraging all voices to be heard and stating clear objectives concisely. Give the group direction on what the dilemma or problem is and what you hope to accomplish with this experience. Let the ideas flow. Prepare for different learning styles by having paper, post its, chart paper and computers available. Remove roadblocks to thinking - time, money and resources are limitless! Everyone’s ideas should be treated equally this means avoiding larger discussions about any specific ideas in order to enable the ideas to flow quickly and freely. Once the initial brainstorming is over, usually 10 to 15 minutes, ask people to look at the ideas and see if they can expand, build on each other’s ideas and add other thoughts. This stage can be done silently through writing or you can have a short discussion. Remind people to suspend judgment and determine what the next step will be. Now is the time to refine the ideas. This step is usually more efficient if it is done individually by the instructional designer. Start by developing a criteria to refine the ideas. Categorize ideas and develop themes where possible. Eliminate ideas that aren’t feasibly or instructionally sound. The best ideas should rise to the surface if your objectives were clear and the process followed with fidelity and with the right people in the room. Our brains are designed to problem solve. Some people may have more experience with brainstorming, but everyone can do it. If you skip this step when trying to solve a problem, you might not get the most innovative solutions on the table. The instructional design technologist’s job is to bring out the creative spirit of their team so they can be inspired and motivated to develop the best possible solutions to the problems faced by their organization. 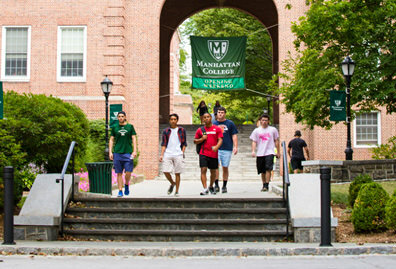 Manhattan College’s instructional design program will help you prepare for this work using experiential, problem based learning as the foundation of the work.